Welcome to issue 12 of liveartwork DVD, a unique publication showcasing contemporary live art. The latest issue features six artists and over an hour and a half of video. This issue is more of a personal selection than previous issues as all the performances were filmed by myself at festivals and event that I attended. So this is essentially a small selection of some of the most interesting performances I have seem over the past year. First is German artist BBB Johannes Deimling, with his second appearance on liveartwork DVD. Here he presents an intimate and visually poetic work. Ingolf Keiner is another, influential German artist who presents a short but compelling performance originally presented at the Men Only event in Berlin, organised by Deimling. Los Torreznos are a renowned Spanish performance duo who I was pleased to have the opportunity to see at the eBent festival in Barcelona with a dynamic piece of sound and language based performance. Then there is another leading Spanish artist, Nieves Correa with a solo performance she presented at the Performanssi festival in Turku, Finland. From Brussels there is work from a relatively young artist, Gaëtan Rusquet which was filmed at the AccionMad festival (organised by Correa) with a work that takes the notion of balloon animals to a very unusual conclusion. Finally there is another performance duo - Ali Al-Fatlawi & Wathiq Al-Ameri who are based in Switzerland and presented this subtle and visually rich performance at the Unforseen IV event in Berlin. Total running time of the DVD is approximately 91 minutes. BBB Johannes Deimling (Born Germany, 1969) uses everyday objects to create living images reflecting a society full of contradictions, sentimentality, stupidity, creativity and co-operation. Finding ideas and influences from the banality of daily life, he transforms themes such as patience, will, war, religion and transportation into physical and poetical images. Since 1988 Deimling has worked as an artist in the fields of performance art, action art, video, installation, drawing and music. His work has been presented at events and festivals in Europe, Israel, Canada, South America and Cuba. Since 1998 he has devoted much of his practice to lecturing and teaching on performance art at various academic institutions including the F+F School for Art and Media Design in Zürich, the Estonian Art Academy in Tallinn and the TU in Dresden in Germany. He also founded PAS - Performance Art Studies, a workshop project for international art students and young artists which has been realised in Canada, Germany, Israel, Serbia, France, Poland, Norway and the Czech Republic. Since 2011 Deimling is working at the NTA - Norwegian Theatre Academy in Fredrikstad. Ingolf Keiner studied Communication Design and later Fine Art at the University of Arts Berlin with Rebecca Horn. In numerous international exhibitions he has worked on the synergies between actions and performative installations, photography and video. In 2000 he founded with Jonas Burgert the exhibition series Fraktale which took place most recently in 2005 at the Palace of the Republic in Berlin. After managing the Education Institute Berlin, he has been teaching installation and performance at the University of Arts Berlin since 2008. A Kata is an exercise form consisting of stylized fights which are waged exclusively against imaginary opponents. In Personal Kata I alone am the opponent, preparing for the fight against me. Every Kata mediates a specific, characteristic fighting style. But it is interrupted by informality in its form again and again. Something is aching, dirt gets under my fingernails or I feel like I have no more desire. I enter on my knees and finally I’m running backwards against the wall, but my body doesn’t bounce. La noche electoral is a language and sound work inspired by the attitude of flamenco. The project plays with political memory through the repetition of the names of historical figures from the 20th Century. The work focuses on power and the meaning given to names, or the names which endow power with meaning. The piece concentrates on the everyday collective memory of power and one which consciously avoids the opportunism of the zeitgeist. These are the names of the century, the names of history. We have learned them day after day. Now, we give them back, in a simple act, not bereft of a certain rhythm. I nourish myself from daily life as an inspiring element for my work, perhaps because I am not very imaginative and have always had my feet on the ground. The "daily nature" in my performances is not only on what I say, I never liked boastful speeches, but on how I say it: with my presence, in the spaces I choose and with the materials I use. Let's say that from the tangible reality I like building up different stories. This performance was a relatively short one, about 40 minutes, and as the name suggests it is a compendium of previous work. 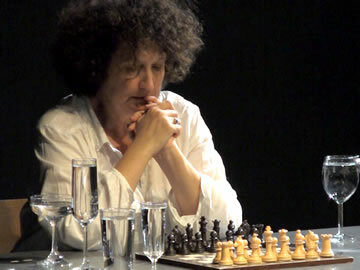 The work is organized around a table and a chessboard and I play both players. Since the performance has no temporal or spatial challenge and is relatively short I am interested in exploring the "presence" in a doubled way, through the chessboard. The change of players happens under the table and like many of my works it develops from order to chaos. 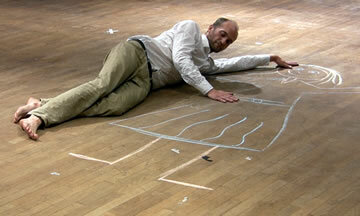 Ordered space is transformed into a chaotic space filled with the remains of the performance. After having completed three years of studies in applied arts in Paris, Gaëtan Rusquet (born in 1984) received his Masters in scenography at l’ENSAV La Cambre in Brussels. Now he lives and works in Brussels as a performer and scenographer. He frequently presents his work in Belgium as well as in Poland, Spain, France and Finland. Through his performance and stage related proposals, he is questioning the body, trajectory, passage and trace between presence and absence, from skin to architecture. And by the confrontation of intimacy in the public space, between interiority and exteriority, he explores different ways to deform the body until its disappearance. It seems at first to be just a silly game with balloons – and a redundant one – which we know is not as innocent as it looks. Balloons that have become limbs and signs of what could be found inside, balloons turned into astonishing poodles, rabbits and snakes. Light as air balloons that can be quite irritating. Either this or that, organs brought out into the open air, uselessness becoming fun: a body disappearing under a heap of coloured shlongs, of pink candy bars, and the thin latex skin about to pop, creaking against skin and teeth, between hips and walls. Ali Al-Fatlawi & Wathiq Al-Ameri are based in Switzerland and collaborate together as part of the studio Urnamo founded in 2002. They have known each other since their childhood and they studied together at the Bagdad Arts Academy. In 1994 they decided to escape Saddam‘s regime and set off on an Odyssey. With false papers and just three US dollars in their pockets they crossed the border into Jordan. There they worked as ‘Copyists’ – reproducing classic Arabic paintings and so earning enough money to travel to Sudan and take a truck through the Sahara, into Libya and finally to land in Switzerland. There the two artists founded the studio Urnamo with the idea of further developing their work through collaboration. Ali and Wathiq have already graduated from their studies at the F+F Art and Media Academy in Zurich. The performances we have presented over the last 9 years have all had the same basic idea. We want to find a material that we can combine with another or with a location to produce different images. Through its use of various spaces and content, performance differs from other art works. The large volume of material, the changing of place and time and the infinite possibilities of topics means that performances are always renewable and expressive. The same work can be monotonous too, if you cannot feel any variations in the created images. In another kind of art, these views for a work are not possible. We think that the whole performance should be designed to present images; instant images without words or translation. We try to perform in this way: images, moments, change, disappearing from the place and staying in memory. We hope that this is how the spectators experience the work. All the images we create in a performance are aimed at working together to communicate our theme. The spectators translate them through feelings and not through the mind so that it is possible to have a pure mediation. © liveartwork 2011. All Rights Reserved.